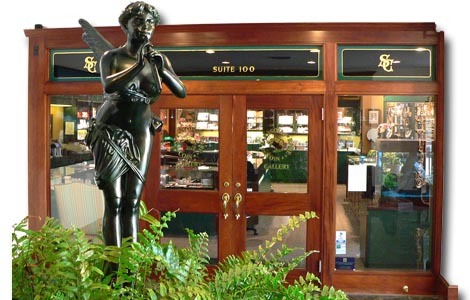 To enter Sarasota Rare Coin Gallery is to experience a portal to the past, a place where you can hold the face of an obscure coin in your hand and hearken back to bygone eras of grace and adventure. So say David Klein and Kent Gulley, owners of Sarasota Rare Coin Gallery and longtime students of the art of numismatics— the collection of rare coins. Klein and Gulley share more than 40 years experience as dealers in the unique and precious. Ben Todd fullfills the duties of Auction representation and rare coin buying for clients around the counrty. A partner in Kentucky, Jeff Garrett, adds another 25. To these four gentlemen, every day is a treasure hunt. Sarasota Rare Coin Gallery buys, sells and trades both U.S. and foreign coins and currency. In addition, Klein, Todd and Gulley are dealers in precious metals and coin jewelry. Gulley says everyone collects for different reasons, but the advantages are abundant. “Because they hold tangible value, paper currency and coins were seldom destroyed,” he says. As a result, he adds, “we can hold the threads of history in our hands. It is a great way to learn geography, history and language.” A gallery of this caliber in a city the size of Sarasota is rather unusual.